I have to admit that there are not many fish lovers in our house. I seem to be the only one who loves fish, but they'll eat it if I make it for dinner. Needless to say I do not make it very often. However, when my husband is traveling I tend to take advantage of that time and I usually cook up some fish. This recipe can be used with any white fish, so whatever kind you prefer will go wonderfully with the Parmesan dill coating. Preheat oven to 375, and spray a large baking dish with cooking spray (the size of your baking dish will depend on the size of your fish). Pour milk into a large container, and place the haddock into the milk and turn to coat. Add the Parmesan cheese, bread crumbs and dill to a large plate and mix it all together. Take the each piece of haddock and dredge it in the Parmesan mixture and turn to evenly coat each side, pressing firmly. Place each haddock fillet in the baking dish. Take a quarter of the lemon and squeeze the juice over the top of each fillet - a quarter of the lemon per each fillet. 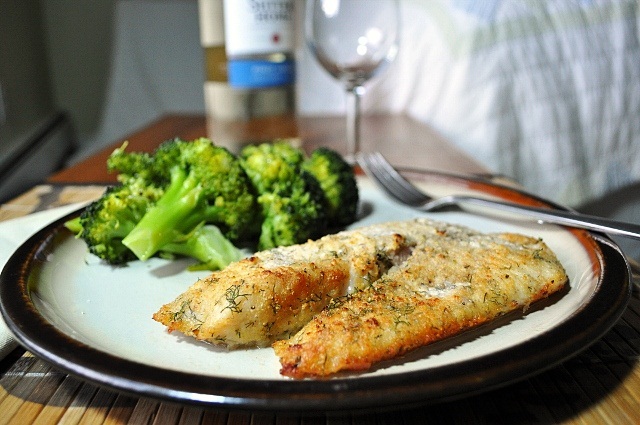 Melt the butter in a small bowl in the microwave and sprinkle it evenly on top of each fillet. Place baking dish in oven and bake for 20-25 minutes. My daughter loves fish dishes, and so does my husband. I love neat recipes like this. Thanks much for posting. Thank you - I hope you'll try it and enjoy it as much as I do! Love this great post! I'm delighted to have found your blog!